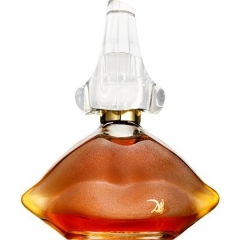 Dali (1995) (Parfum de Toilette) is a popular perfume by Salvador Dali for women and was released in 1995. The scent is oriental-floral. The longevity is above-average. It is being marketed by Cofinluxe / Cofci. The surrealism of a perfume. Since surrealism is one of my favorite currents in art and Dali is on the top ten list of favorite peinters, I, blindly, ordered this perfume de toilette a couple of years ago without knowing how much I would love it and , so far, I tried to save it as much as I could for fear that it might go out of production. It is still made and I started purchasing the bottles wherever I find them. The scent is a good representation of Dali's personality, i.e it starts strong, dissipating the clove and frankincense with such a generosity that you have to hold your breath. The rose starts sparkling and comes to rest on the soft bed of oakmoss and musk. The accord is beautiful. Although it is presented as a Perfume de toilette, its strength is the one of an eau de parfum and the sillage is great without disturbing. Amazing scent and unique in the carousel of new fragrances who seem to have lost their personality.